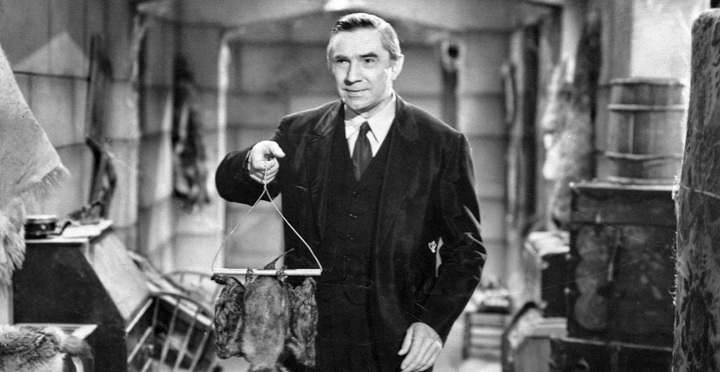 If only “kindly” Dr. Paul Carruthers (Bela Lugosi) didn’t bottle everything up inside, he might have died in comfortable old age, rather than from a Devil Bat attack. (Devil Bats are murderous mutant creatures of the doc’s own making). Dr. Carruthers may be all-smiles on the outside, but don’t be fooled; this guy’s on a mission of revenge. The doc believes he was swindled by a cosmetics company that made millions off his formula for a greaseless cold cream. (Actually, Carruthers could have had a piece of the action, but insisted on an upfront cash payoff.) The busy doc has three professional specialties: he is the beloved village doctor of sleepy Heathville; he continues to develop formulas for the cosmetics company; and, in secret, he creates Devil Bats. These flying monsters — so named by a newspaper reporter — are electronically augmented bats that attack anyone wearing a one-of-a-kind scent supplied by the doctor. The entertaining, low-budget stinker “The Devil Bat” was the first horror film from the “Poverty Row” studio Producers Releasing Corporation (PRC). 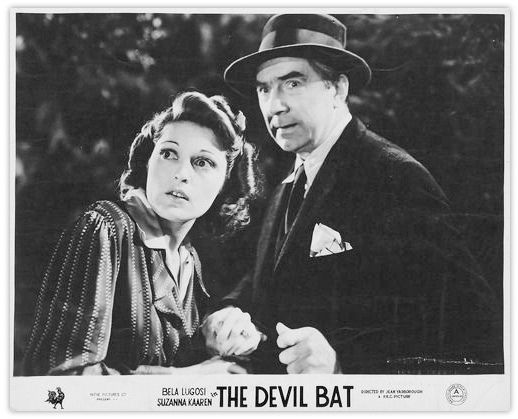 “The Devil Bat” preceded Lugosi’s so-called “Monogram Nine” — nine films the actor made for another Poverty Row house, Monogram Pictures, between 1941 and ’44, when his career was seriously meandering. 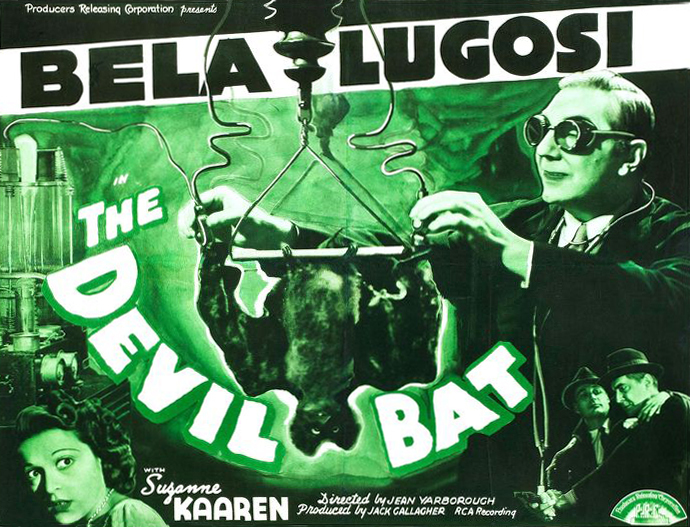 Lugosi’s performance in “The Devil Bat” — an undeniably watchable caricature — is echoed in those subsequent nine films (which often cast Lugosi as a mad scientist). It is also a precursor to Lugosi’s final onscreen speaking role: as Dr. Eric Vornoff in writer/director Edward D. Wood Jr.’s “Bride of the Monster” (1955). Watch the two films side-by-side, and see if you don’t agree. Some of Lugosi’s takes and line-reads in both films are virtually identical — albeit, separated by 15 hard years. A digression: When the contractors built the doc’s home, he apparently requested many secret passageways accessible only by hidden doors — de rigueur for mad scientists in those days. Intended targets: At left, all of Carruthers’ targets are conveniently assembled in one drawing room. At right, the doc offers a few drops of his “experimental” after-shave lotion to a soon-to-be Devil Bat victim. Start the presses: At left, ace reporter Johnny Layton (Dave O’Brien) gets the Heathville assignment from irascible editor Joe McGinty (Arthur Q. Bryan). O’Brien is best known to cult cinema aficionados as the pot smoker who repeatedly says “Faster! Faster! Play it faster!” in the campy cautionary film “Reefer Madness” (1936). Bryan is best known as the voice of Elmer Fudd. At right, Johnny and his sidekick, photographer One-Shot McGuire (Donald Kerr), meet the Heathville police chief (Hal Price). Johnny, it should be noted, is unencumbered by journalistic ethics. He makes an off-the-record pact of blanket mutual cooperation with the police; carries a gun (and uses it) on assignment; and makes a romantic play for a subject of his story, heiress Mary Heath (Suzanne Kaaren). Other than that, he’s clean. Say “cheese”: You can’t trust newspaper photographers, either. At left, Mary’s French maid, Maxine (Jersey City native Yolande Donlan), cooperates with a smile when asked to show “more stocking” while posing for a cheesecake photo. At right, One-Shot eagerly memorializes the moment. Media frenzy: In the days before the Facebook and the Twitter and the Instagram, folks kept up with the latest Devil Bat news via radio and newspapers —two mediums that are still in existence today. Domestic bliss: Loner Dr. Carruthers contentedly tends to one of his Devil Bats. Maybe things wouldn’t have gotten so out-of-hand, had their been a Mrs. Carruthers. Fightin’ words: “You’re a dreamer, Doc,” says Henry Morton (Guy Usher), admonishing Dr. Carruthers for insisting on a cash payoff rather than becoming a partner in the company. 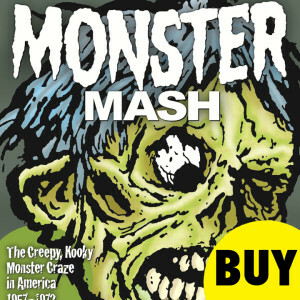 This makes Carruthers lose his cool. Spoilers follow: Johnny, who has figured out the whole scenario, puts on some of the deadly after-shave lotion. But it is Dr. Carruthers who, splashed with the lotion by Johnny (yet another journalistic misstep), loses his life to a Devil Bat. Oh, the irony! VIDEO: Watch “The Devil Bat” below.